The soft bendable large diameter tubing makes it extremely comfortable to properly position behind the head while maintaining ease of breathing on the surface. When diving, the mouthpiece tucks neatly under the chin for the ultimate in hydrodynamics. The anatomical hypoallergenic silicone mouthpiece provides extreme comfort during long durations in the water. The CORSICA is available in either black or green and is an excellent choice for the discriminating diver who is looking for the best equipment. The Corsica is the ideal snorkel for freediving, spearfishing and scuba diving. Very light and comfortable. Large diameter snorkel tube provides unobstructed ease of breathing. 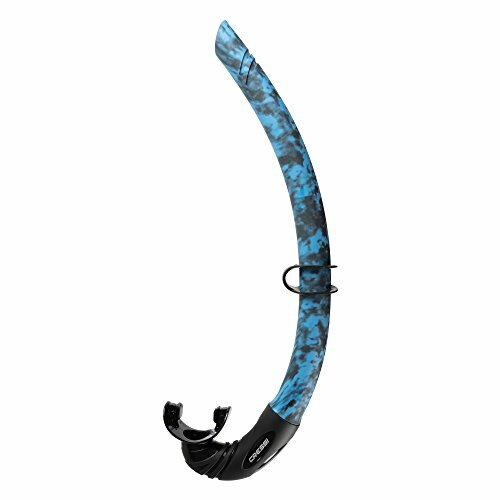 Soft bendable snorkel tube to maintain proper and comfortable positioning. Specially designed and molded u-bend provides easier clearing capability. Anatomical hypoallergenic silicone mouthpiece provides extreme comfort during prolonged use. It is ultra flexible and can be fold and store in the BCD pocket. The Corsica is designed and made in Italy by Cressi, a brand pioneer in freediving, spearfishing and scuba diving equipment.